Once there was a saint who took up residence behind a certain king's palace with a view to benefiting him. Each morning he would shout loud enough so that the king could hear him, "Part of my time is spent like a king and some better than a king." The king went on listening for few days until one day he got enraged. He went to the saint and said, "You are a beggar. You live on stale food given by others. What do you mean by utterances like this every morning?" 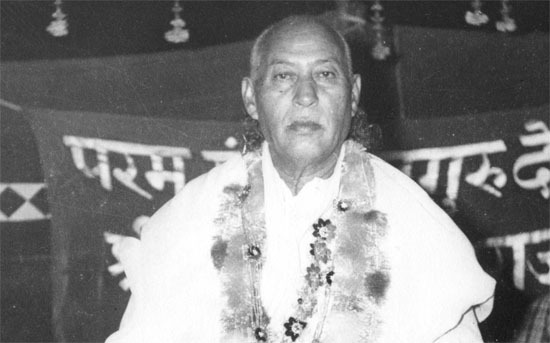 "Kabir sumiran saar hai, aur sakal janjal. Adi ant Madhya sodhiya, dooja dekha khyal." Simran - Remembrance of Holy Name is the essence of human life. The rest is all a mess which will forever remain unsolved. Worldly pleasures can be enjoyed by most other species also. But you must know the Name and Light of God and take shelter of true saints. Rich and people in high positions today think that they themselves are the creator and destroyer. The whole world is crying out for food, clothes and housing. Our leaders are busy arranging big conferences, meetings and programs so that our countrymen can get food, clothing and shelter, but despite their innumerous efforts, everywhere there are people who are hungry and without adequate clothing. No one except God can fulfill our needs or protect us. The officials do not know the importance of the human body, hence they all are full of arrogance and ego. Once a potter's son found a ruby while he was digging. He thought it was an ordinary red stone so he tied it around the donkey's neck. He loaded mud on the donkey's back and went to town. He had sold the load and was returning home. On the way, he met a jeweller who saw the jewel hanging from the neck of the donkey. He immediately understood that the potter was ignorant of the value of the stone which is why it was around the donkey's neck. "Heera parkhe jouhari, shabda parkhe sadh. Jo jan parkhe sadh ko taka mata agadh." A jeweller knows the value of a diamond while it is a saint who knows the Word. And great are those that understand a true saint. So the jeweller asked the potter, "Will you sell it?" The potter had been carrying mud throughout the day. He thought that it is worth it if he gets a few pennies from selling it, otherwise to him the stone has no value. He replied, "Yes, I am ready to sell it, but how much will you give?" The jeweller replied, "I am ready to give 500,000 rupees for it." The potter thought that either the jeweller was playing a prank on him or probably the stone is precious one. It is best to know more, so he replied, "No, I will not sell it." Then the jeweller offered him a million rupees. But again the potter refused. Finally, the jeweller offered several million rupees for the stone. The potter was very happy with the deal to sell the stone. The jeweller paid in cash, whatever he had with him, and for the balance wrote cheques. The potter then handed over the stone to the jeweller. As soon as it came into the jeweller's hands, the stone broke itself into pieces and a voice was heard "You jeweller, you knew that I am priceless and yet you put a price on me. So I have broken into pieces as I can't live with you. It was okay till I was on the donkey's neck as the potter was ignorant, but I can't live with you." This is just a story, an example. Similarly, this human body is the costliest jewel. No one can purchase it at any price. But we are ignorant like the potter and have tied it to the neck of our mind while we carry like mud loads of illusory worldly pleasures. After all, everything you do is for the body and what will happen when it is dead and is burnt or buried? You should think about this and do something for enriching and awakening of your soul. After death, these worldly pleasures and powers will not be of any use. "Arab kharab loun sampada, uday asta lon raj. Tulsi jo nij maran hai, awey koune kaj." After death, none of your millions and billions will be of any use to you. I am of the opinion that remembrance of the Holy Name of God and meditation on the Divine Light only will do you good. So, everyone should take advantage of the opportunity of this human life by acquiring the knowledge of Holy Name and Divine Light. This is the religion for all mankind. This is the Light, which is beyond moon and sun and this is the true and easy method to concentrate the mind. The purpose of human life is to acquire the highest peace, that is, salvation. God is truth, consciousness and bliss and is one and the same for all. So there can be only one religion or one path for all mankind. downloaded from http://www.manavdharam.org/books_mags/online_magazines/md/2008/oct_08/hansji1.html on 1st April, 2009.